When I got to work this morning and sat down to check my email, I almost immediately noticed a little pain in my hand. This pain is not new, but it got me thinking about a condition that is becoming more and more common these days- carpal tunnel syndrome. With the rise of technology, we spend almost all day using our hands in odd ways (meaning, ways they weren’t necessarily designed for), like typing, texting, and playing video games. While carpal tunnel syndrome can be caused by many mundane repetitive hand motions, our use of technology has made the problem more widespread. People whose professions require them to use their hands, such as chefs and hairdressers, tend to be at a higher risk for developing severe carpal tunnel syndrome. 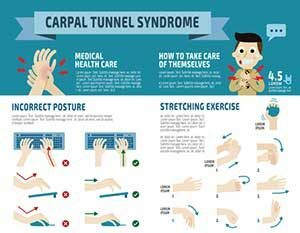 The majority of people do not have it as bad as those professionals, but if you have ever noticed a slight pain or tingling in your hands, fingers, or wrists, it is likely a sign of mild carpal tunnel syndrome. Since we do spend so much time now with our technology, it is important to be able to recognize the symptoms of carpal tunnel syndrome, and be able to treat it effectively, so we don’t end up needing surgery. What Is Carpal Tunnel? What Causes It? According to WebMD.com, Carpal Tunnel Syndrome is pain or tingling in your hands and wrists that is caused by pressure on the median nerve, which is the nerve that controls the movement and feeling in your thumb and your first three fingers. That is why an easy way to tell if it is carpal tunnel syndrome is if you are not having problems with your pinky finger, since that is controlled by a different nerve. The median nerve passes through a little space in your wrist called the carpal tunnel. When there is swelling or inflammation (from injury or infection), the carpal tunnel can get smaller, which puts pressure on the median nerve, which causes pain, tingling, and numbness. What Are Symptoms of Carpal Tunnel? Some early symptoms of carpal tunnel will include tingling and numbness in your fingers and your hands. You may also feel pain and tingling along your forearm as well. If the carpal tunnel gets bad, you will likely feel intense pain, so bad that it will interfere with you ability to work and use your hands. – Ice your hands and wrists during the day. Start a couple times during the day, but if needed, ice 1-2 minutes every hour. This will help bring down the swelling and inflammation of the median nerve. – Get a wrist brace. This will help keep your hand and wrist in a neutral position. You can pick one up at any place like CVS or Target. If you don’t want to wear it at work, try sleeping in it. That will help keep your wrist in a neutral position at night, relieving the pressure. – Stretch. Try and stretch out your wrists and hands at least every couple of hours. Holding on to the tops of your fingers, bend the wrists as far forward and as far back as possible (without injuring yourself). This will help with blood flow. – Hand Massages. Regular massages for your hands, wrists, and arms will help decrease symptoms. If your company can’t afford to hire a full-time hand massage person, here is a great article that shows you some basic reflexology you can do on your own that will help relax the muscles and nerves of your hands. – Be Healthy. Eating right and exercising regularly will have a big impact on your nerves. Being out of shape and eating the wrong foods only causes more pressure on your nerves, which may actually increase the symptoms of carpal tunnel. – Painkillers. If the symptoms get too bad, you may need to try some painkillers like Advil to help. However, DON’T go for this solution first. You are not actually treating the underlying cause, just providing some short-term relief. Plus, taking too many painkillers too often can have other harmful side effects. For example, if you take too much aspirin, if can cause stomach pain. A good rule is that if you feel the need to take painkillers, it’s probably time to see your doctor. Carpal Tunnel Syndrome can become a serious problem if it is not recognized and dealt with early. You may end up needing surgery, and even then it is unlikely the pain will be completely gone. So, while all our technology has helped us move forward and progress at a remarkable pace, just remember that our bodies aren’t really made for it. We need to take care of ourselves so we can fully appreciate the wonderful advances we are making for many, many years.